This entry was posted in Media Coverage, Print, TV on 10/09/2014 by admin. This entry was posted in Media Coverage, Print, TV on 17/06/2014 by admin. Deepan Budlakoti was born in Ottawa and held a Canadian passport until 2011, when he was convicted for selling a hunting rifle to an undercover police officer. His arrest led to an investigation and he was ordered to be deported. He has also faced drug trafficking charges in the past. Budlakoti’s parents came to Canada, working at the Indian High Commission and argue they left before he was born. “My parents left the country, got a work permit and re-entered the country with the work permit working for a Canadian doctor and then I was born,” said Budlakotti. However, the government contends his parents were still diplomatic staff when he was born in 1989, meaning Budlakotti’s passports were issued in error. Deemed criminally inadmissible to Canada, Budlakoti faced deportation but was rejected by India. 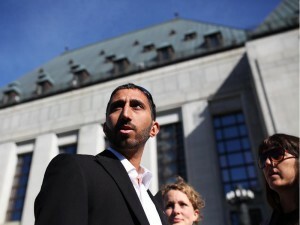 “He’s not an Indian citizen, so he’s become de-facto stateless”, says his lawyer, Ahmad Ramadan. Budlakoti hopes to stay in Canada, and considers it his home. An Ottawa-born man who has served jail time for gun and drug offences has asked a Federal Court judge to declare him a Canadian citizen and end his debilitating episode of statelessness. This entry was posted in Media Coverage, Print, TV on 16/06/2014 by admin. 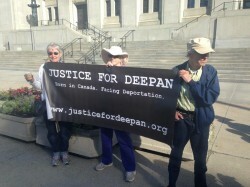 Deepan Budlakoti was in Montreal on Jan. 21 and 22, 2014 as part of his Reclaiming citizenship, Rejecting double punishment campaign. He sat down for an interview with journal Ensemble on the 21st and visited Justin Trudeau’s Montreal office on the 22nd. Here’s some footage from both events. This entry was posted in Media Coverage, TV on 05/02/2014 by admin. This entry was posted in Media Coverage, TV on 14/10/2013 by admin. TO SEE VIDEO OF DEEPAN’S INTERVIEW, CLICK HERE. A Canadian-born man is fighting to stay in the country as he faces the prospect of deportation to India by the Canadian government after serving time for weapons and drug trafficking. Deepan Budlakoti, 23, has lived his entire life in Canada, but for months he has been caught in what he calls a bureaucratic nightmare after the Canadian government revoked his passport and issued a deportation order. Budlakoti could be sent to India – a country he’s never set foot in. “I don’t know no one there, I have no family there. I have no nothing there,” he told CTV News. This entry was posted in TV on 06/07/2013 by admin.